Hookedblog first discovered the work of eL Seed in Paris back in 2013 when we had the opportunity to visit La Tour Paris 13 curated by Galerie Itinerrance. The celebrated French Tunisian ‘calligraffiti’ artist had decorated the entire side of the tower block as well as redecorating one of the tower's apartments. Blending Arabic calligraphy with graffiti techniques, eL Seed has developed a distinctive and striking style that fuses poetry and language with dramatic design to create his large-scale works. 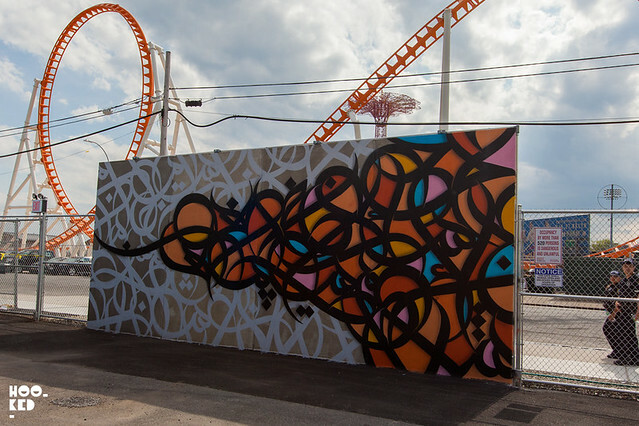 We were fortunate to catch the artists work again on a recent visit to New York pictured above, where eL Seed was one of the many artists invited to contribute to Jeffrey Deitch's Coney Art Walls in Coney Island, New York. As part of this years Shubbak Festival, London’s largest biennial festival of contemporary Arab culture, eL Seed will paint a large-scale mural in East London. We are excited to see the artist in London for this his first UK commission and look forward to sharing his London mural with you, stay tuned for updates! Day 02 of painting on the huge wall at Village Underground.